I have seen Julie Buxbaum. The fist time she showed me the book I became so interested. Right now I am reading the book. During the sign in I was the very first person to sign my book. I was very thrilled. Now when I first came to the book festival, that will be the very first experience I will ever encounter. During the whole event I was speechless, but still managed to talk & in a good way. It's not every day that you get to meet the #1 New York Times Bestselling author of a YA trilogy of some sort which is why at every heartbeat I was full of hope, meeting my role models for not only reading, but to life. My attempt to not fanboy in front of Mr. Dashner himself, sadly failed, I couldn't just act normal like everyone else I had to stand out, despite my urge to wanting to fit in, though what made this trip even better than usual, was the fact that I got to even have a conversation with Mr. Dashner, asking him about the comparison the Maze Runner has with other YA series, such as The Hunger Games &/or Divergent. I would never forget how his voice sounded in my ears for the first time in person & I may haven't gotten my book signed, but I sure did get the opportunity to meet & chat with some of my favorite authors. And I know that this is just the beginning because next year will just kick it up a notch & whatnot. Thank you, Mrs. Onco & the chaperons! For giving me this opportunity to see a writer I have dreamed of sighting since last year after reading his very first book. I can't wait for next year!!! I am so impressed with these young students experience and impressions at the book festival! Awesome job Ms. Onco!! The whole festival was an amazing experience that was an unforgettable experience. One author that left a big impression in me was writer James Dashner during his panel. In the panel he told us a story of how he came to write his The Maze Runner series. First when he wrote the first version of the Maze Runner they would not publish it so he gave he gave u on it and instead worked on something else. One day his wife asked him what happened to the series he replied with they wouldn't publish it, she replied to him by saying that maybe he should keep working on it and try again. He did and he almost started again from scratch, all he knew he had was the characters and a bit of the plot. Once he was done again, he said he felt the story was much more better than the one before, soon it got published and made a movie. This proves that we should not give up in anything eventually something good will come out of it. One of my favorite panels was the book-tuber panels with Alberto Virallreal, Emily Ables, Naya Perkinsion, and Whitney Atkinson. I have been a fan them for a while and watched them on YouTube every time the upload a new video, so it was like meeting a celebrity. They where amazingly funny and cool. I learned how they started of in the begging and what kind of books they prefer to read and review. 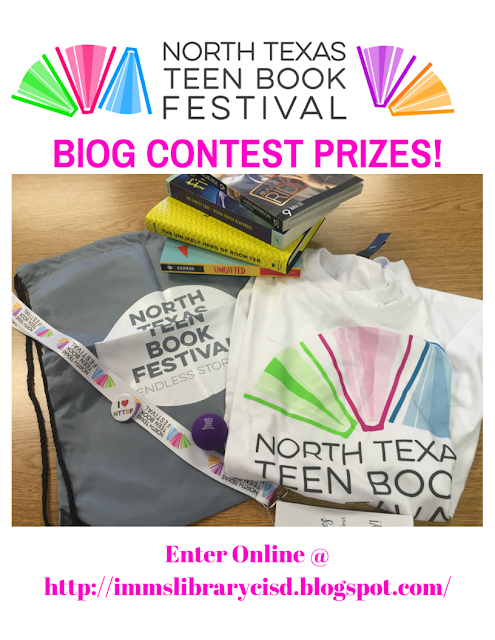 Over all I had an amazing time at the North Texas Teen Book Festival and I hope I can go back next year. 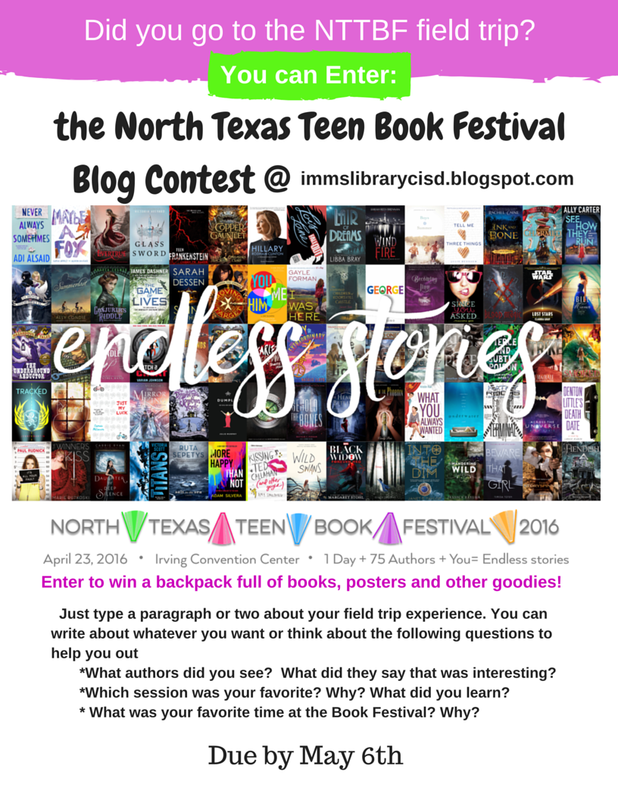 Hi my name is Jeremy C. and I went to the North Texas Teen Book Festival. My experience was fun because I got to meet so many authors and I got to ask them a lot of questions. My favorite session was Paranormal because I love scary stuff and I read about them all the time. So I mostly read it every day. The saying that the authors said were they're favorite foods at first I thought it was odd but some of it was interesting. My favorite time at the festival was when I got to meet Gayle Forman. I love her books, they inspire me to do things I never did before. I loved the North Texas Teen Book Festival because I learned so much and I hope to learn more things about other books. At the NTTBF I had a great time with my friend and books. I got a book signed and we all paid for it. As a good deed we gave it to Mrs. Onco. She was so happy with it she almost cried. I have never had such a better time in my life. I got to meet Jeramey Kraatz and Margaret Stohl it was great I even got her email. I had such a blast. Yes, thank you Jade, Cameron and Chaylee! It was a most wonderful gift, given from the heart. I loved it at nttbf. I got to meet Jeremy Kratz, Gwenda Bond, Margerat Stohl and Gordon Korman. We walked around and went to different panels. My favorite panel was Where's my super suite because the authors were super funny and talked about the different books. My favorite thing was when we were buying a book and we found a pre-signed copy will most definitely be going next time. I loved the NTTBF it was so much fun. We met Jeremy Kratz and sat next to him in a panel. My friend and I found a book signed by Jeremy Kratz, it is the sequel to The Cloak Society. He signed our copy of the first book The Cloak Society. We also met Margret Sthol. She was really funny. I can not wait to go back next year. I absolutely loved NTTBF. I GOT TOO MEET MARGRET STOHL!! I spent a ton of money but it was worth it. Me and my friend got too see James Dashner and other awesome authors. I got 3 books signed and I was really excited too show my family. I will not forget this day ever. The NTTBF was amazing. My friends and I went to the Jeremy Kraatz panel's. We also got a pre-signed book from him! Also we got a ton of signatures from many different authors. I got one of Margaret Stohl's signatures with a sticker, that I now have on my phone case. The authors we met were funny and looked like to have a great personality. Overall the NTTBF was an amazing experience and I can't wait to go again. The day of the NTTBF was one of the best days ever. We met many different authors and even got a few signatures. I was lucky enough to get Margaret Stohl's e-mail after one of the panels. In the building they had a section where you could buy books, my friends and I found the next book of the cloak society. Lucky for us the book was the last presigned book in the series, we didn't have enough money to buy it though, that is when a nice lady gave us a dollar to buy it. We gave it to Mrs. Onco for her to keep. At the last panel we sat with the authors because there were no more seats and they were nice enough to let us sit with them. NTTBF was great it was the best thing i have ever done.i got to buy a book by Gordon Korman. the panels were amazing and funny. i got to meet the author of If I Stay. i hope next is even better i cant wait.i hope more people come next year so we can share the greatness. NTTBF was better than spending time with your whole family, you sort of are because books are like family with people like me. NTTBF was like heaven for all book lovers and that's all i needed. I'm not sure I can ever go back to any other place, after an experience like this. This place is appropriate in a space that lends so much gravitas to events. The design at venues in Chicago is sharp and environment is unbelievably good.